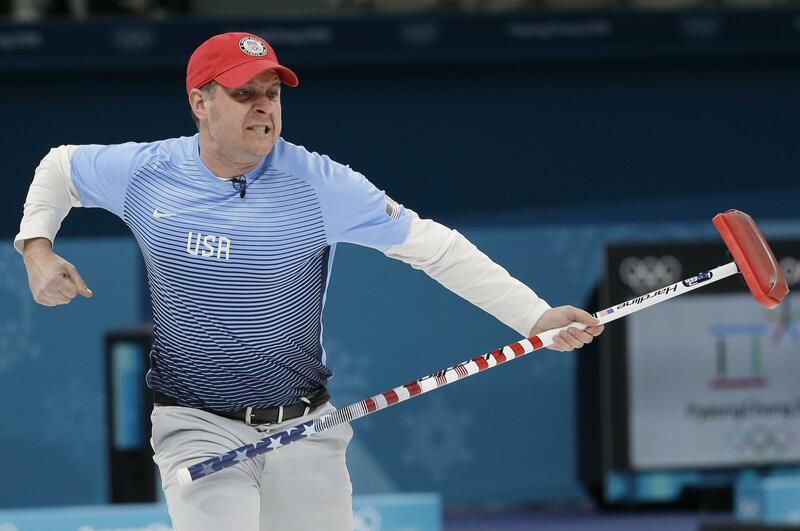 Sun., Feb. 25, 2018, 6:52 p.m.
PYEONGCHANG, South Korea – A hard look settled over John Shuster’s face, equal parts concentration and grit, as if he could move that 40-pound rock with his eyes. The leader of the U.S. men’s curling team had just released a stone and was urging it along, watching it slide down the ice and come to rest at exactly the right spot. Shuster’s clutch shot all but clinched the gold medal in Saturday’s final against Sweden. On a grander scale, it did a whole lot more. Victories in unexpected sports such as curling and cross-country – along with a dramatic win in women’s hockey – helped the U.S. forge a late rally and avoid what might otherwise have been a disappointing, if not embarrassing, 2018 Winter Olympics. Headed for their worst Games performance in recent memory, the Americans rebounded to earn 23 medals, fourth in the overall standings behind Norway, Germany and Canada. Still, that number pales in comparison to the 28 at the 2014 Sochi Olympics and the 37 at Vancouver four years earlier. It also fell short of the U.S. Olympic Committee’s own expectations. According to an internal document obtained by the Associated Press, USOC leaders predicted a repeat of the Vancouver performance. There is something about the American sports psyche, a “just win” mentality that cannot settle for anything less, even in sports such as biathlon and ski jumping that most fans don’t care about until the Olympics come around. For much of the last three weeks, the U.S. team has settled for “pewter” medals – Olympic-speak for finishing just off the podium. The Americans had 35 athletes finish fourth through sixth. The Americans could have reached their goal if less than half of those near-miss athletes had skied a tenth of a second faster or landed one more jump in figure skating. And some of their struggles stemmed from issues beyond anyone’s control. Last spring, bobsled icon Steve Holcomb was found dead in his room at a national training site, having succumbed to a combination of alcohol and sleeping pills. Holcomb ranked among the top drivers in the world, winning three medals in the last two Winter Games. Without him, the U.S. men managed no better than ninth place. The alpine ski team similarly lost potential contenders, such as Jackie Wiles, Steven Nyman and Travis Ganong, to injuries shortly before the Games. But that probably doesn’t account for the drop in medals from eight in Vancouver to three here. The team appeared to lack the depth of which Ashley spoke, with a noticeable gap between young talent and aging stars such as Lindsey Vonn and Ted Ligety. Pyeongchang revealed other systemic deficiencies. Despite bronze medals in ice dance and the team event, figure skating stumbled in the high-profile singles events, with Nathan Chen and Mirai Nagasu failing to meet expectations. This was a program that won seven medals in 2006 and four in 2010, then dropped off a cliff at the 2014 Winter Olympics. Team members insisted they had moved past the “Sochi disaster,” but only a late victory in the women’s team pursuit saved them from being shut out for a second straight Games. “If we perform we perform, and if we don’t, we don’t blame anyone else,” veteran Joey Mantia said. Pyeongchang came at a difficult time for USOC officials, who have faced sexual abuse scandals in gymnastics and swimming back home. But dealing with those issues might ultimately affect performance too. Historically, USOC leaders have acted as a distant overseer to the national governing bodies that run each specific sport. Now, they will probably step in and exert tighter control. There are positives in the wake of the Games, starting with victories by snowboarders and freestyle skiers, who accounted for nearly half of the U.S. medals. That cross-country gold – won by Kikkan Randall and Jessie Diggins in the team sprint free – represented the first ever by American women in that sport. Overall, women led the way for the U.S., outdoing the men 12-9. With other Americans heading home less satisfied after Sunday night’s closing ceremony, officials promised their reassessment will be far-reaching. Norway’s success might be part of the process. With roughly the same population as Colorado, the Norwegians dominated in traditional winter sports such as biathlon, cross-country and ski jumping. Their 39 medals broke the record set by the U.S. eight years ago. Published: Feb. 25, 2018, 6:52 p.m.